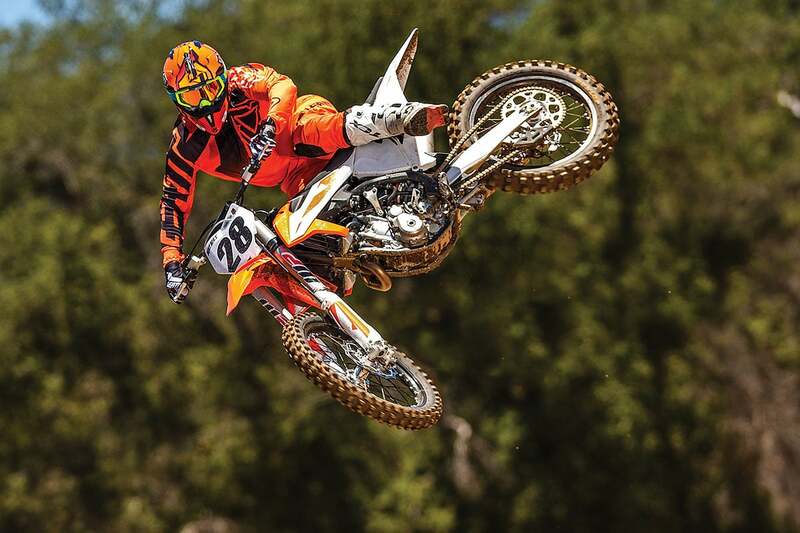 When it comes to racing a 350 against 450s in motocross, there are two camps. One believes that the 350 is a huge advantage for the average rider, that the benefits in handing and the confidence it gives the rider are more than enough to compensate for any shortfall in sheer power. The other camp consists of those who have never tried a 350. 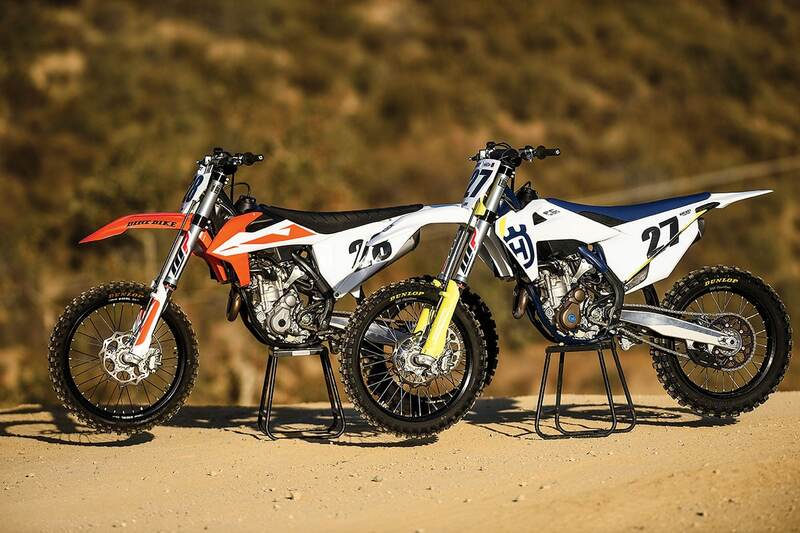 In the MX world, the entire 350 class boils down to just these two bikes—the KTM 350SX-F and the Husqvarna FC350. of part numbers, making the KTM and Husqvarna irresistible subjects for comparison. The parent company sees Husqvarna as a premium brand and sets the price slightly higher. Bodywork: Both bikes got new plastic for 2019. Seat cover: The Husky’s is grippier and has a slightly different shape. Airbox: The Husqvarna has a composite polyamid airbox with different airflow characteristics. Handlebars: The KTM has Neken; the Husqvarna has Renthal. hydraulics; the Husqvarna has Magura. 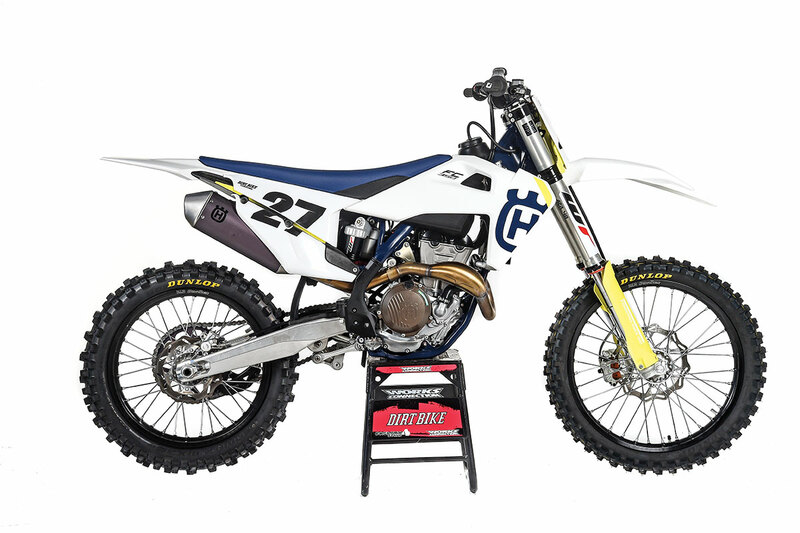 Rims: The KTM has Takasago Excels; the Husqvarna has D.I.D Dirt Stars. 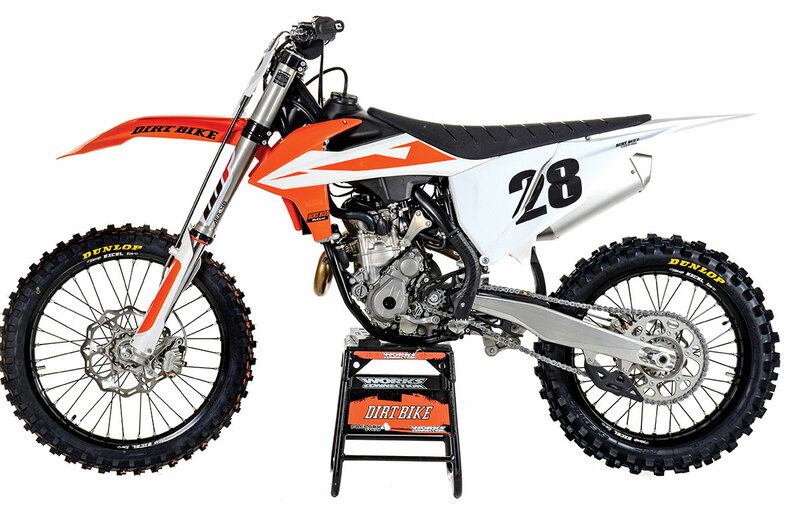 Cosmetics: The KTM has silver spokes and engine cases; the Husky has black spokes and gold cases. 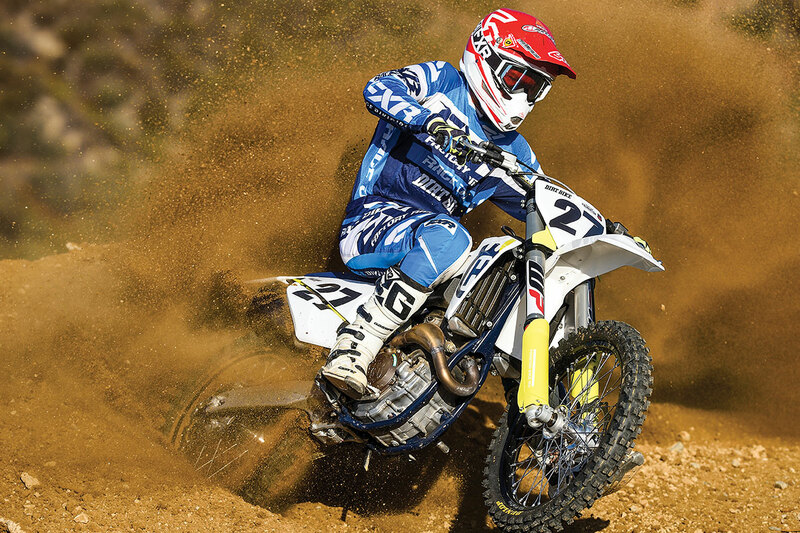 Weight: The Husqvarna is a 1/2-pound heavier on our scale, mostly due to the airbox. Oddly enough, they both round off to the same figure—222 pounds. Mystery ingredient: We have always felt there is a difference in suspension valving, but every time we have looked, we’ve been proven wrong. We keep believing what we believe anyway. Not different: Some Husqvarna models have Magura brakes, but not this one. Some Husqvarna models have different mufflers from KTMs, but not this one. Price: The Husqvarna is $100 more expensive—$9799 versus $9699. Is the KTM faster? 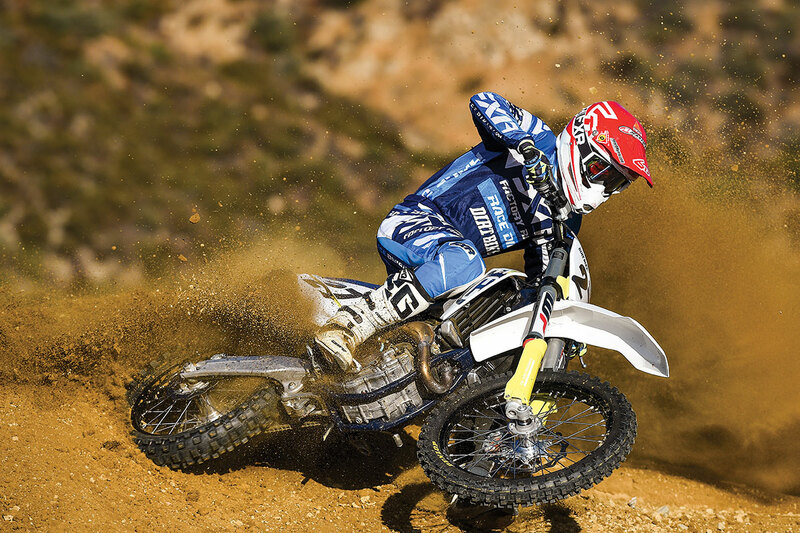 Most riders say it feels snappier and more responsive than the Husqvarna. This year both bikes have a significant number of changes. They can’t be called “all new,” but they look pretty different. 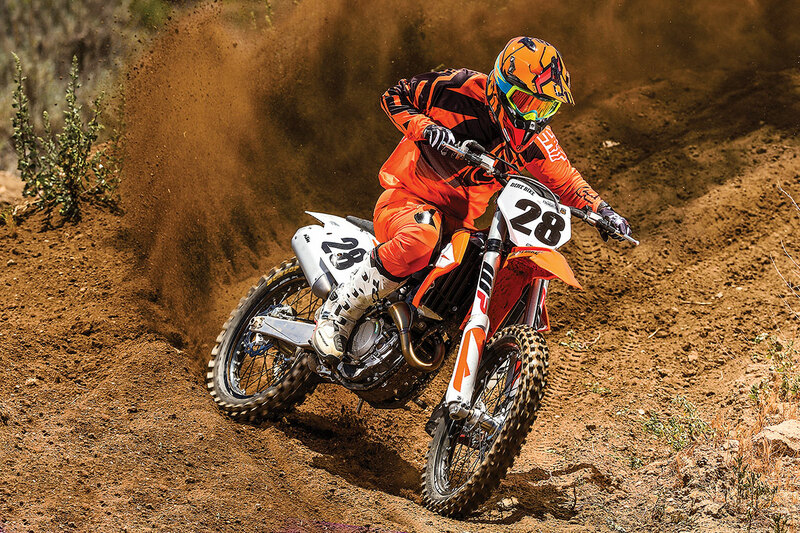 The chassis changes were carried over from the 2019 KTM 450SX-F and Husky FC450, which, in turn, were the same as the changes that the KTM Factory Edition and the Husqvarna Rockstar Edition got prior to the start of the 2018 racing season. Those changes are based on a new frame, which is said to be stiffer in every plane. The swingarm has a longer chain-adjustment slot, which the factory team apparently uses for fine-tuning handling characteristics in testing. Both the KTM and the Husqvarna got new bodywork, although different from each other. The radiators are mounted 12mm lower. The 350 motors finally get the DDS clutch and diaphragm spring that have been used on the 450 and bigger two-strokes for years. The head is lighter and the exhaust is new. You no longer have to remove the shock before removing the pipe thanks to a slip fit in the middle. The goal here isn’t to talk riders out of their 450s. There are a fair number of riders who are brave and strong and really can use the extra power. And there are others who don’t care about power at all. They just don’t want to shift. Those guys are on either end of the bell curve. For the big hump of riders in the middle of the curve, a 350 is a better bike. You should know up front that a 350 isn’t any lighter than the current 450s from KTM and Husqvarna. They weigh exactly the same—222 pounds without fuel on our scale. You should also know that a 350 doesn’t make that much less power. It comes out to about 3 horsepower at peak. Most dynos place the 350s around 54 horsepower, whereas a good running 450 is 57. The reason that mere mortals can ride a 350 so much better boils down to one thing—confidence. The bike might not be lighter, but it feels lighter. It might not be slower, but in the rev range where you spend most of your life, it feels slower. Both those facts make you feel like you can master the bike rather than it mastering you. On a 450, you tend to under-rev the bike. It’s just so much easier to lope along at 4000 rpm than tempt fate by gassing it harder. On the 350, you can’t really do that. In order to make the bike go, you have to rev it. And the more you rev it, the more fun you have. And because there’s so much less gyro effect, a 350 turns with much less effort. Again, it has nothing to do with weight, but the perception of weight on a 450 can slow you down. The biggest technical differences between the Husqvarna and the KTM boil down to different components. On the track, though, the two bikes have distinct personalities. As we said, in every shootout, regardless of class, the Husqvarna and KTM have finished back to back. You simply can’t share this many parts and expect much separation. But, when you have only these two bikes in a comparison, small changes seem larger. The biggest difference between the 350s is power. The KTM is more aggressive and snappier, and it seems to genuinely be faster. It’s not appropriate to call either bike “hard-hitting.” They both have incredibly smooth power deliveries and very wide powerbands. The trick to riding either one is to stay on it. If you keep revving the bike higher and higher, there’s more and more power. The workable rpm range is much wider than most riders realize. We can explain the power difference by pointing to the airbox. We don’t have an explanation for the difference in handling. The KTM has a heavier-feeling front end. That changes the way you ride the bike. On the Husky, you have to climb further forward to make the front wheel bite. That makes it a little more demanding to ride. We made sure that all the suspension settings were identical, but all riders agreed that there’s a distinct difference. Perhaps the bodywork and handlebar bend position the rider differently, or perhaps there really are suspension differences. Is that a big deal? No. At the end of the day, the KTM 350SX-F and Husqvarna FC350 aren’t identical bikes, but there are more similarities than differences. The two different personalities don’t offer much in the way of advantages or disadvantages on the track. That brings us back to what we said earlier: A brand’s identity is about more than part numbers. Racing programs, dealerships and legacy all go into the mix to determine whether or not you identify with a brand. The first step, in this case, is admitting that you’re in the middle of the bell curve and that a 350 makes sense. Is a 350 a better 450 than a 450? Many riders think so.